Can the Panthers solve the legendary goaltender? It was just the Florida Panthers’ luck that they would run into old foe Martin Brodeur and the New Jersey Devils in the first round of the Stanley Cup Playoffs. After missing the playoffs for ten consecutive years, the Panthers finally managed to get back into the NHL’s postseason, only to matchup with the same team and goaltender that swept them out of the first round of the 1999-2000 playoffs. Funny how these things work out isn’t it? When the series began, there were questions as to how much Brodeur had left in the tank. He hadn’t won a playoff series since 2007 and seemed to be at the twilight of his career. After the Panthers stunning comeback in Game 3, which saw them score four unanswered goals (three against Brodeur), it appeared that the naysayers were on to something. However, Brodeur quickly silenced his critics in Game 4, turning aside all 26 Panthers shots to claim his 24th career playoff shutout, which set a new NHL record. For the Florida Panthers, then, the question remains: how can they solve the legendary netminder? In two games of the series, Games 2 and 3, the Panthers have been able to get to Brodeur, scoring three goals against him in each game. In the other two games, Games 1 and 4, the Panthers have only managed two goals total. So what’s been the difference? The first crucial difference between Games 2 and 3 and Games 1 and 4 has been the traffic in front of Brodeur. 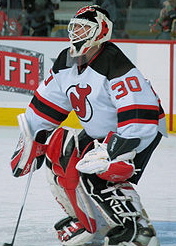 In Games 2 and 3, the Panthers constantly had players in front of Brodeur to create havoc in front of his net and force him to see around bodies in order to find the puck. While there’s no doubt Marty is a hall-of-famer, this doesn’t change the fact that like every other goaltender in the league he struggles when his view of the shot is obstructed. While this certainly isn’t a big secret in terms of hockey strategy, it’s something that the Panthers clearly need to focus on in order to disrupt Brodeur and the Devils defenseman. The Cats need players like Tomas Kopecky, Sean Bergenheim and Scottie Upshall to crowd Brodeur’s crease area and make every save a challenging one. If Brodeur is allowed a clear view of the shot, it’s basically a guarantee that he will come up with the save. Crowding the crease will also lead to the next crucial difference from the two sets of games: rebounds. In this series, Brodeur has been extremely sloppy with his rebound control, often gifting juicy rebounds right into high traffic areas. In Games 2 and 3 especially, the Panthers pounced on these rebounds, with Stephen Weiss banging in two goals in Game 2 and Sean Bergenheim scoring off a rebound in Game 3 that would ignite the Panthers comeback. However, in their losses, the Panthers were unable to cash in on their rebound chances and thus had difficulty scoring in those two games. It’s clear, then, that these two areas are not only crucial in solving Brodeur but they’re also related. By creating traffic in front of Brodeur, the Panthers will also gain more rebound chances. As a goalie is forced to fight through traffic, he becomes more concerned with simply stopping the shot and loses focus on his rebound control. With players in front of the net, defenseman are sucked in as well, struggling to move the players out of the front of the net, which keeps them from clearing out rebounds. This often leaves the slot open, and it is something the Panthers must take advantage of in order to beat Brodeur and the Devils. As the Panthers prepare for Game 5, which is back in Sunrise, they would be wise to begin to focus on these two areas that have led to their success against Brodeur and rededicate themselves to creating havoc in front of the Devils net. The Panthers have a legitimate chance to upset the Devils now that they have reclaimed home ice, but a loss in Game 5 at home would be devastating to those chances. So while it may be a funny coincidence that the Panthers find themselves facing the Devils and the same goaltender that knocked them out the last time they were in the playoffs, losing again would be no laughing matter.